The shale boom might have died down, but it is far from over. Over the past year the U.S. shale boom in the U.S. has basically ground to a halt. The culprit: rapid production growth that overwhelmed the market with oil and gas, sending prices plunging. Check out the chart below for an illustration of the stunning rise in crude and natural gas output over the past few years. While it will take some time for the market to adjust to the production spike, oil and gas companies are already adjusting. Well costs are plummeting, which is improving the returns companies can make at lower oil and gas prices. This means energy companies can still make a large amount of money on production, even if prices remain well off their peak. This is particularly true of the five companies below, which are the best stocks for investing in the shale boom. The three best stocks to invest in the oil side of the shale boom are EOG Resources (NYSE: EOG), Devon Energy (NYSE: DVN), and Continental Resources (NYSE: CLR). All three companies have the capability to deliver double-digit, low-cost oil production growth in the years ahead. In fact, Devon Energy and Continental Resources this year plan to deliver output growth of 25%-35% and 16%-20%, respectively. While EOG Resources does not plan to increase its oil production this year, that's only because it is waiting for higher oil prices and lower oil-field service costs. The value created by waiting is far more compelling for the company, as shown on the following slide. All three companies are in a prime position to create significant value even if the shale boom slows over the next few years. That's because these companies have very low-cost oil supplies, which will deliver strong returns even at current prices. All three also have solid balance sheets, which will get them through the current downturn and then provide them with the capacity to grow once conditions improve. It's the combination of low-cost oil and financial flexibility that makes these three great oil stocks for the shale boom. 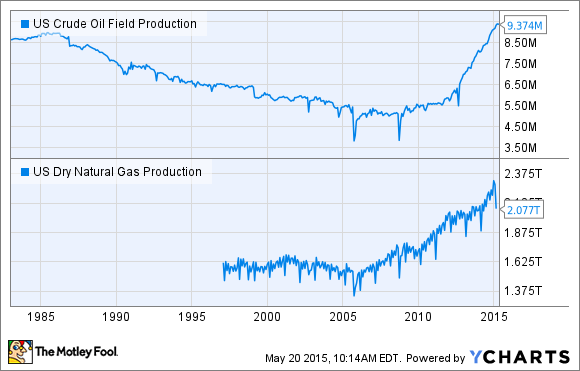 While oil has been popular of late, natural gas started the shale surge. The current leaders here are Chesapeake Energy (NYSE: CHK) and Southwestern Energy (NYSE: SWN), as the pair now rank second and fourth in terms of the largest onshore natural gas producers in the U.S. as we see on the slide below. As that slide shows Southwestern has really zoomed up the leader board over the past few years. It has had little competition as most other drillers, Chesapeake Energy aside, are focused on investing to grow oil production. Looking ahead, that's not expected to change as few companies can economically grow natural gas production like Chesapeake and Southwestern. Chesapeake Energy has recently slowed its growth and plans to increase production by just 1%-3% in 2015 as it strives to live within its cash flow. Despite cutting back Chesapeake Energy earns strong returns on new wells as in the Utica shale, for example, its expected rate of return is 25% at $3.25 gas and $60 oil. Those returns, combined with a bounty of cash on the balance sheet, courtesy of Southwestern Energy, will really incentive Chesapeake to accelerate natural gas production growth as gas prices improve. Chesapeake received its cash bounty from Southwestern after it shipped out its southern Marcellus assets late last year. Those assets are expected to help fuel a remarkable 23% year-over-year increase in Southwest's 2015 production, even though the company's capital expenditure budget has dropped by nearly 20% from 2014. One other reason Southwestern can still grow at such a rapid rate is thanks to its ultra low finding and developing costs, which last year came in at $1.62 per mcf. Suffice it to say, both companies have the economic assets that will really drive strong growth once the shale boom in gas reaccelerates. While rapid shale growth in the U.S. is on pause, it's only a matter of time before conditions improve. Furthermore, well costs have fallen to the point that energy prices don't need to regain their former peaks for these companies to make a lot of money. Great assets and low costs make these five companies the best stocks for investing in the shale boom.